Get the latest on what's happening at SMS. Senior Market Sales produces an incredible amount of useful material. The SMS website is home to more than 1,200 blog posts, videos, articles and reports. And we create more every day. The 21st Century Cures Act was passed by the House in November and by the Senate in December, and now has been signed into law by President Obama. The 2016 Annual Enrollment Period was record-breaking at Senior Market Sales, Inc. There are record-breaking statistics that help demonstrate how our service and technology helped you during the busiest time of the year. 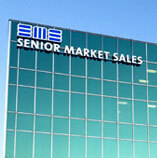 SeniorMarketSales.com gets a new look and added functionality.